This monthly features previews the coming month's attractions in Korean cinema. All of these monthly posts are available in an archive on the Upcoming Releases page. Synopsis: Nameless Gangster chronicles the happenings in Busan, South Korea when the government in 1990 declared its war against crime. 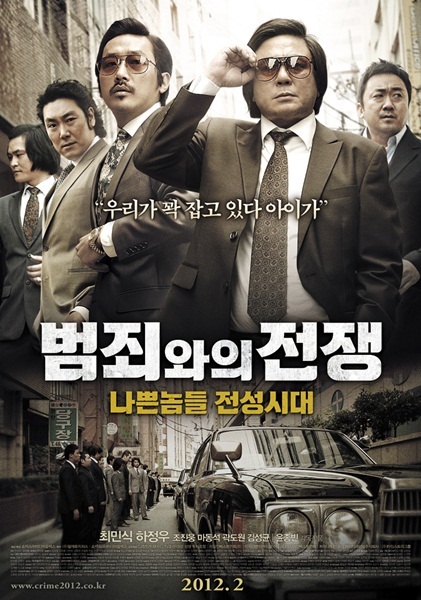 A corrupt public official (Choi Min-sik) faces criminal charges and meets Choi Hyung-bae (Ha Jung-woo), a mysterious man with connections to the Yakuza. Anticipation is riding high for young Yun Jong-bin's third feature after The Unforgiven (2005) and Beastie Boys (2008). The period set gangster film pairs veteran thespian Choi Min-sik (Oldboy, 2003; I Saw the Devil, 2010) and up-and-coming star Ha Jung-woo (The Chaser, 2005; The Yellow Sea, 2010). Numerous impressive stills and some promising trailers have already appeared on the web. Nameless Gangster is shaping up to be one of the 2012's early hits. Synopsis: Choon-Sub (Park Yong-roo) is a talent manager who goes to the US after a client runs off. To stay he must get married for a visa and soon he ends up with six new children. Papa is Han Ji-seung's second film following Venus and Mars in 2007. 90% of the film is said to have been filmed in America and it follows a rash of multicultural Korean films that have appeared recently, such as He's On Duty (2010). Originally slated for the Lunar New Year holiday weekend, Papa was rescheduled due to an overcrowded field. Synopsis: Ji Min and Cheol met in university ten years ago and now live together as roomates and lovers. People ask them why they won't get married since they're at that age but they've never seen the reason to. Life was happy enough as it was until they come face to face with two dark red lines on a home pregnancy test. New documentary which premiered at the 13th International Women's Film Festival in Seoul last March from Ji Min. Her previous film won the Ock Rang Award at the same festival and she had previously also been involved with docs To Live - Save Our Saemankum (2006) and The War, You and I (2010). Synopsis: A man dies by spontaneous combustion. Animal teeth marks are discovered on his body. 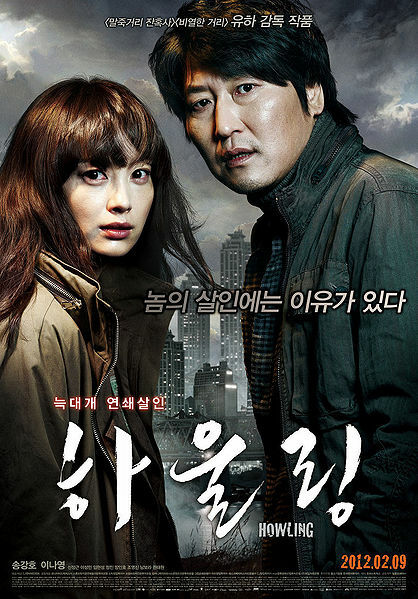 A veteran male cop (Song Kang-ho) and rookie female (Lee Na-young) start to investigate. Without a doubt one of the most promising projects of 2012, Howling is acclaimed director Ha Yu's (Once Upon a Time in High School, 2004; A Dirty Carnival, 2006; A Frozen Flower, 2008) fifth feature. As well as boasting a top cast with Song Kang-ho and Lee Na-young, the film has an intriguing premise which starts off with spontaneous combustion. The moment this project came to light I was already very excited and there are few films I am more eager to discover. Synopsis: Jae-min's (Han Ji-won) dream is to become a super star. His sick mother Yeong-ran (Kim Yeong-son) does what she can to support him. Bar the information provided above and the trailed posted below, I have no further information on this low budget release. Synopsis: A shy novelist falls for a beautiful, confident woman. Jeon Kye-soo's third feature, after Midnight Ballad for Ghost Theater (2006) and Lost and Found (2009). Ha Jung-woo has been very busy of late, racking up an impressive set of credits including The Yellow Sea (2010) and The Client (2010) and has a lot coming up including Breakfast at Tiffany's, The Berlin File, and Nameless Gangster which will be released the same month. The film also stars Kong Hyo-jin who has been equally impressive of late with stand out turns in Crush and Blush (2008) and Rolling Home With a Bull (2010). Synopsis: So-ra has tough luck with her auditions and she blames the directors for her rejections. One She runs into Seung-hyeon, someone she used to act with. He invites her to a film set and So-ra gets to fill in for an actress fails to show up.